If you love receipts—in the Whitney Houston “I wanna see the receipts”-for-my-alleged-$730,000 drug bill sense of the word (which others just call “proof”)—well, has Page Six got a story for you. 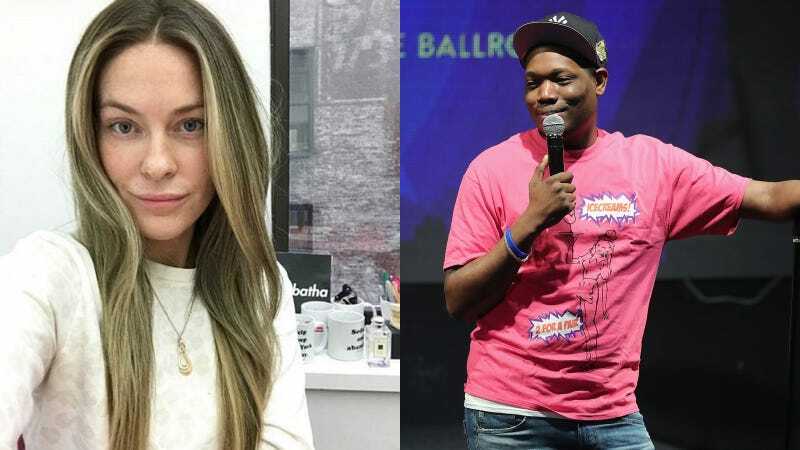 Last week, Married to the Mob clothing line boss Leah McSweeney called SNL’s Michael Che “so arrogant and so rude and disrespectful” on her Improper Etiquette podcast while recounting a text exchange she had with the comedian, who she met on the elite dating app Raya. In turn, screenshots of their exchange were leaked to Page Six, which appear to counter McSweeney’s description of their texts. To an outsider with no horse in this race—and from the perspective of someone who’s experienced plenty of arrogant, rude, and disrespectful behavior from strangers on apps—they seem to have been leaked to refute her characterization of their exchange. McSweeney, with whom I spoke this afternoon, contends that Che “planted” the story after listening to the podcast and leaked their text-based conversation (over the course of which McSweeney texted Che a few times to no response, and also confessed, “We have a lot of friends in common and if any of them saw this I would b so ashamed”). McSweeney says what ran on Page Six is the entirety of their communication via text. Text screenshots via Page Six. The situation—one party tells of an interaction on a podcast, the other party gives physical proof of what actually occurred during that interaction—is reminiscent of the Margaret Cho/Tilda Swinton email exchange that came to light in December. After Cho had negatively characterized correspondence of theirs that occurred earlier in 2016 regarding Swinton’s casting in Doctor Strange, Swinton released their actual exchange, thanking outlets (including Jezebel) for the opportunity to clarify. While nothing in the emails invalidated whatever residual annoyance Cho felt about her Asian expertise being summoned by a white woman, they certainly portrayed a far more civil exchange than Cho had described (she also objectively mischaracterized Swinton’s reason for mentioning a project she was producing starring Steven Yeun). The discrepancies in these cases come down mostly to perceived tone, which is an inevitable consequence of increasing text-oriented interactions in a world of inexpert writers. That both of the conversations described above were rooted in their constituents’ feelings about matters of the heart made for especially subjective individual experiences. To be engaged with technology in 2017 is to be constantly reminded of the multiplicity of human existence. It’s to be faced with the reality that an infinite amount of things can be true at any given moment. But observing that fact, even understanding it, doesn’t necessarily engender empathy. In fact, quite the contrary. I reached out to Che’s manager for further explanation—I will update this post if/when I hear back.